Judy Dawson’s career goes back over twenty five years. She has experimented with different mediums, but has found the planning process that goes into watercolors to be the most stimulating. 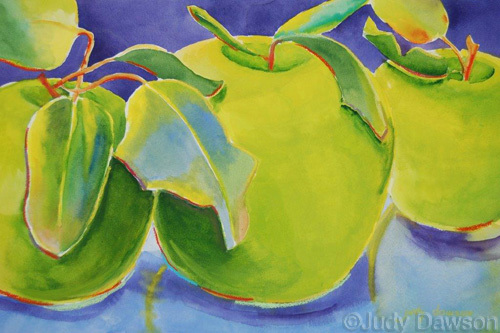 Judy is passionate about her work and loves charging color into color to produce juicy looking fruit, brilliant flowers, or any other subject that is unique, to create her own style. It has been a long process of growth. She does not paint what is, but what she would like to see. Judy is always looking for new ways to change her compositions, therefore, she constantly attends classes, workshops, and goes to art galleries to study great works of art for new ideas to apply to her own work.